Shortly before his 18th birthday, in the spring of 1933, Orson Welles booked second class passage on a tramp steamer, The Exermont bound for Morocco. While onboard he worked on an introduction for a book he was writing called Everybody's Shakespeare. It was to be published by his Todd Seminary school mentor Roger Hill for their school’s press. Everybody's Shakespeare was meant to be an educational device to help children understand the bard. 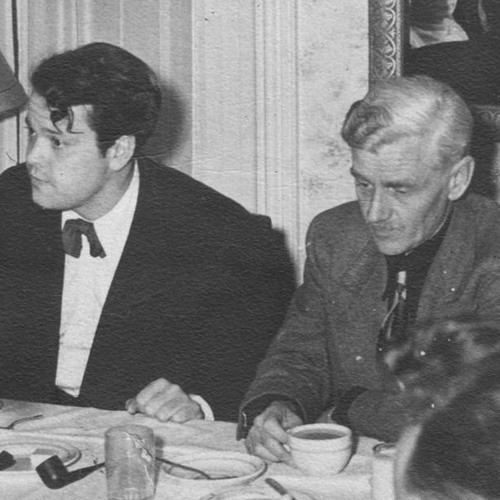 Welles struggled with is own feelings in writing the book. He was deeply worried that he had no right to assume Shakespeare meant one verse to be angry, another to cause a smile. He expressed these fears in a letter to Roger Hill, told his mentor he wished he was here to see the many characters on the steamer, and included a bit of poetry about life on the high seas: Days now numberless it seems to me We've lolled and wallowed in a lusty sea. Time is a thing that used to be. The order and ascent of days is nothing now A March-blown ocean mauls our plunging prow, An acreage hysterical for us to plow Crash in the galley. Crashes are constant now Shiver the empty "Exermont" from screw to prow. Time is a thing that used to be. The order and ascent of days is nothing now.